Question: St. Jude's Ranch for Children no longer accepts used greeting cards. Can you please remind me of the Honolulu group who will take them, including an address? Answer: St. Jude's, which has three locations dealing with abused and neglected children in Nevada and Texas, decided to give up its Recycled Card Program after it was inundated with more than a million greeting card fronts. Officials said the cost of handling the mailings was siphoning funds needed for the children. At the other end of the spectrum, Waipahu Intermediate School teacher Merlinda Oania says she is "desperately in need of Christmas cards" so that she can continue to make Christmas alphabet books for children at Shriner's Hospital and Ronald McDonald House, as well as for the Salvation Army. "I'll start working on the 2006 Christmas alphabet books during the summer, so I'd be very grateful if readers send me or drop off their used cards before then," Oania said. You can mail or drop off the Christmas cards -- fronts only, please -- to Oania at Waipahu Intermediate School, 94-455 Farrington Highway, Waipahu, HI 96797, or at her home, 98-596 Kaimu Loop, Aiea, HI 96701. She also is willing to pick up the cards. Call her at 486-0236 (home) or 675-0177, extension 305 (school). 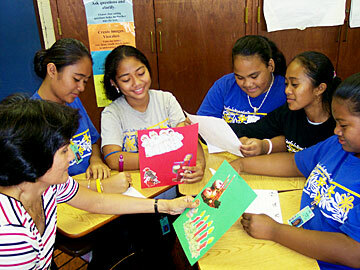 Waipahu Intermediate School teacher Merlinda Oania, left, with her students Beki Tarupi, Aleen Carlos, Isa Sirom, Andrea Paul and Rachel Aitab, work on their Christmas alphabet books. Oania is continuing a volunteer tradition started by the late Helen Daniels, known as the "Christmas Card Lady of Kailua," who made books using recycled Christmas cards, passing them out to hospitalized children at Christmas time. Daniels died in June 2000; Oania took up the project in 2003. Oania said she couldn't make as many books last year as in 2004, when she was able to deliver 85 books, because she did not have enough cards. In fact, there were only enough books -- 20 -- to deliver only to the Ronald McDonald House this past Christmas, she said. Oania has involved her English as a second language students in the project as a learning tool. She spends her summers cutting and pasting the pictures onto pages, then has her students write the text as part of class assignments. They enjoy making the books, she said, "even though it was not an activity done for the fun of it." She said the book-making this past year was a follow-up activity to one of the stories they read, "A Christmas Story," by Walter D. Myers. Waipahu Intermediate is an America's Choice school, and the story, about sharing at Christmas time, is part the school's English Language Arts curriculum, Oania explained. In a discussion on how people can share Christmas, one student remembered working on the Christmas alphabet books the year before. "The class wanted to do it again this year as a project, so we spent the last week of school before the Christmas break doing the books," Oania said. In addition to learning about sharing, she said her students learned a lot of vocabulary associated with the holidays; cultural aspects of Christmas, comparing and contrasting Christmas in Hawaii with their home country; and wrote papers using what they learned. Oania said her seventh- and eighth-grade students "are very much a part of my volunteer work." She wants to provide her students, from various Pacific Islands, as well as countries such as Korea and the Philippines, with "an opportunity to do something for others -- give something in return for all the things they are getting," after immigrating to Hawaii.